Foothills Townhouses Subdivision is in the central part of the North Area of Tucson, AZ. 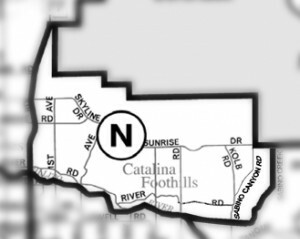 Families living in Foothills Townhouses Subdivision are served by the Catalina Foothills School District – District 16. Restaurants to visit if you are living in the Foothills Townhouses Subdivision or another subdivision in Tucson’s North area are Blanco Tacos + Tequilla and North Italia Restaurant. Both in the La Encantada Shopping Plaza. Considering A Home In Foothills Townhouses Subdivision? Are you thinking of buying a home in the Foothills Townhouses Subdivision or another area of Tucson area? Finding the right home can be a challenging process. But we can make the process much less stressful for you. Thinking about selling a home in Foothills Townhouses Subdivision?